CSS is the de-facto standard of web styling and is used to enhance the presentation of markup languages. Web designers everywhere use it to improve accessibility and maintain consistency amongst pages. CSS: The Definitive Guide – Eric A. Meyer is an excellent place to begin learning about CSS. All you require to have is a beginner’s knowledge of HTML and you are ready to go. Meyer is a well known web design consultant, author and an expert on CSS. Meyer starts from the basics of cascade and inheritance and drills into details of not only how but also why of almost all topics. You would find details of how and why even on oft ignored topics as font and colour units used. The reader is not bored with details of obsolete or proprietary CSS properties. Instead, Meyer focuses only on properties (CSS2 and standard CSS2.1) which are supported by most web browsers and are actually in use today. The related properties are grouped together into separate chapters and they are well organized. For example, the chapter on font properties is followed by one on text properties and one visual formatting by a chapter on padding and borders. This makes it easy for the reader to find what he is looking for. A couple of interesting chapters on UI styles and non-screen media complete an exhaustive and informative book. 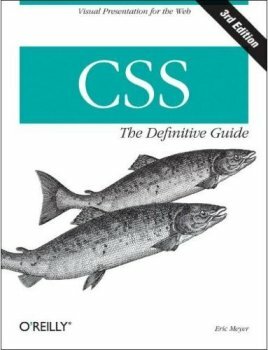 This is followed by an appendix of various CSS properties references that you will find yourself going back to again and again. The book lacks only two things. Colour pages and problem solving. The book tells you about floating and positioning but does not tell how to use it to create a two column layout. Nevertheless, it is a very informative and useful book. Though not “definitive” it is certainly a great book for anyone, right from experienced users to complete novices. Disclaimer: I was provided the book for review by O’Reilly Media.